Home → Blog → Surfside Hotel at East Beach, Westport. Surfside Hotel at East Beach, Westport. View extra large image in a new window. 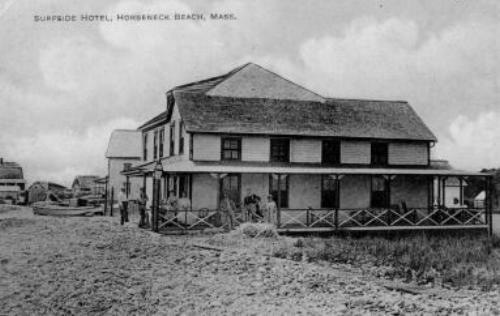 Surfside Hotel at East Beach, Westport. Proprietress was Mrs. Lydia L. Gifford; the rates were $8.00 – $10.00 a week. Mr. John I. Gifford operated the general store and post office behind the hotel and was an avid duck hunter. The Surfside began as a meeting place for Mr. Gifford’s duck hunting friends. This photo indicates that folks other than hunters enjoyed relaxing at the beach also. The Surfside was located on East Beach Road opposite John Reed Road. This entry was posted in Horseneck Beach.